Hi Marc Rossi, You've got a good sound. Email me at scott@hot-radio.com. Scott www.hot-radio.com/lasvegas 2 years 1 month ago. Tonight at Ryles Jazz Club at 9pm! Marc Rossi Group with special guest Randy Roos 3 years 3 days ago. We had a wonderful time at the Tim Ingles memorial at Scullers Jazz Club last night. Many great musicians were there, and there was so much love and good will. Here's some photos: Pianist and MC Frank Wilkins with Carolyn Ingles; the whole group singing "The Creator Has a Master Plan" at the end; and a selfie of me and my musical brothers Syd Smart and Stan Strickland. 4 years 2 weeks ago. I had a wonderful time last evening at a gathering that included the renown Dhrupad singers the Gundecha Brothers (photo where Marc is sitting down), and Khyal singers Dattu Velenkar and Pradeep Shukla (photo where Marc is standing up.) The Gundecha Bros. gave an impromptu lesson in Dhrupad that was beautiful and nuanced. 4 years 2 weeks ago. Tom McKinley Remembered: A personal reflection It’s hard to believe Tom is gone. He was such a force in my life and in the lives of so many others. To me, Tom is what music is all about--a love of the medium, passionate drive, and the relentless pursuit of creative excellence. He set a standard to which I continually aspire. Being a composer and jazz pianist, Tom served as a role model for me from the moment I met him. Up to that point I was frustrated, feeling that being a serious composer would mean giving up all the love I had for jazz and spontaneous improvisation. Tom helped to confirm what I sensed—that I could do both, abolish this duality, and see creative music as a higher unity. He showed musically and spiritually that one could embrace both--though notes, gestures, and at every imaginable level. In that sense, he is a true American original, and probably the first American classical composer who was also a major post-bop jazz pianist. Tom played with people like Hank Mobley, Roy Haynes, Miroslav Vitous, and Eddie Gomez to name a few. Put together with his enormous output of chamber music and orchestral compositions, he occupies a unique place in music history. When I first began studying with Tom, I was blown away by his playing. Then I heard performances of his chamber pieces, and was further blown away. When I showed Tom my compositions he helped me to see the depth of my own potential, to value my own ideas, and to ignite them. He was both a composition teacher and mentor, much the way Mel Powell was for him—one of his own teachers who he often spoke of. Tom once remarked that “none of his students sound like him” which is a testament to their talent and to his teaching abilities. His gifts were so huge he didn't need to create musical or ideological clones. He was intensely prolific, beyond most living composers, and wanted his students to truly become themselves. Everyone who studied with him had his/her life transformed. Some of my happiest moments with Tom were when I had the chance to make music with him—as a fellow composer on MMC recording sessions, or as a colleague on a jazz concert. My orchestral music appears with Tom’s on the MMC New Century Vol. VI CD, recorded in Katowice Poland in 1994, and on A View from Charles Bridge, recorded in Prague in 1999. Tom offered tremendous insight during the recording process itself for all the composers. His ears were lightning fast, and he knew just what to suggest, and how to do it tactfully so as not to step on the conductor’s toes. He understood the orchestra as few do, and anyone who studied with him knows what a great orchestration teacher he was. I also had the privilege to play jazz alongside him on some recent ECMP concerts and I still get a rush like I did back in 1975 when I first met him. His death should inspire us to work harder, and honor his legacy. RIP Tom, and see you on the other side. Marc Rossi 4 years 2 months ago. With Mantra Revealed, Rossi continues the work he began on Hidden Mandala: bearing the standard for pan-Indian jazz fusion into the present tense and beyond. As a student of both Hindustani and Carnatic Indian music and a professor of piano and jazz composition at Berklee College of Music, Rossi has been a vital part of the Boston music scene for the past two decades, and he’s assembled an all-star cast for Mantra Revealed. Lance Van Lenten (saxophone and flute), Bill Urmson (electric bass), Mauricio Zottarelli (drums), and Rossi himself make up the core Marc Rossi Group, supplemented by Prassana’s adventurous, Indian-inflected guitar on opener “Jazz Impressions of a Kriti,” the sumptuous voice of Geetha Ramanathan Bennett, and the furious fret work of Bruce Arnold. The album’s rich panoply of colors and textures comes from the interplay of Rossi’s own distinctive compositions and the players’ absorbing improvisational skills. It’s become commonplace to refer to an album as a “journey” these days, but few navigate a path as wide-ranging, engaging and multi-hued as Mantra Revealed. 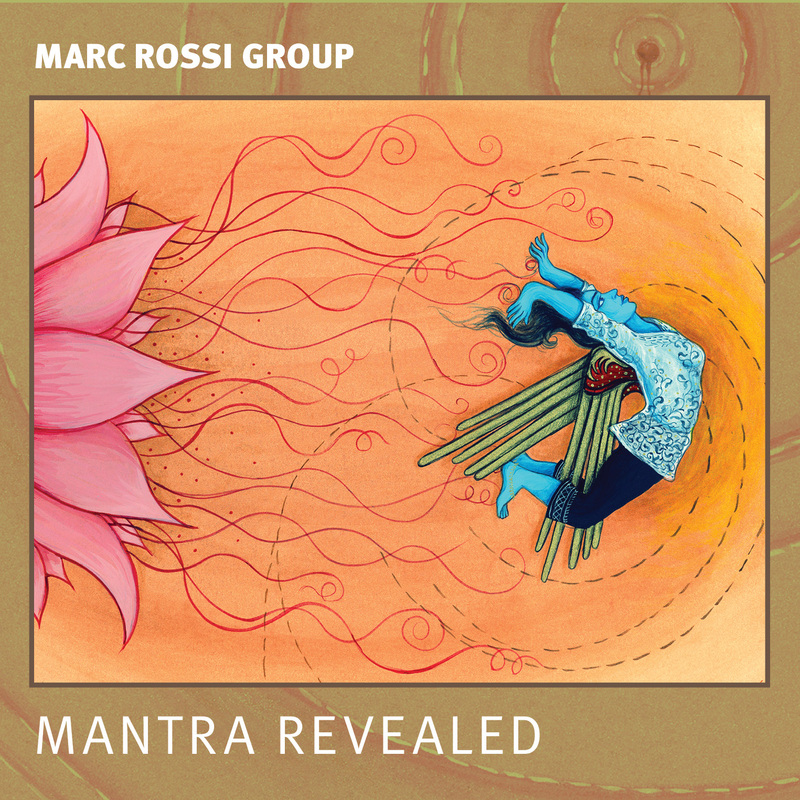 “Marc Rossi is the hip guru of jazz-Indian fusion. [He combines] the tightness and precision of Indian improvisation with the freedom of jazz expression." —Richard Stoltzman, Grammy winning clarinet soloist.